I have so many dreams for my life, and just as many passions to go along with it. I have all these things I want to do, but it’s so much it’s overwhelming and I don’t know where to start. Today is June 1st. The beginning of the month as well as the beginning of a new week and I have decided now is the best time to start going for my dreams. My two biggest passions are writing and baking. Because of my recent run in with depression, neither has taken any part in my life. It seems that when I get depressed the things I love the most take a back seat while I wallow in my sadness. The good news is, I will not be unemployed in a few weeks. I just returned home from an interview for the deli/bakery of my local grocery store. Hopefully I will end up being more bakery than deli. And this is just the first step to achieving my dream of owning my own little bakery one day. I will do it, I will have it. It will be cute and clean and shiny and I will even bake doggy treats. See, having a puppy has brightened up my life! I want to take some cake decorating classes so I can better my techniques and really give the people what they want. 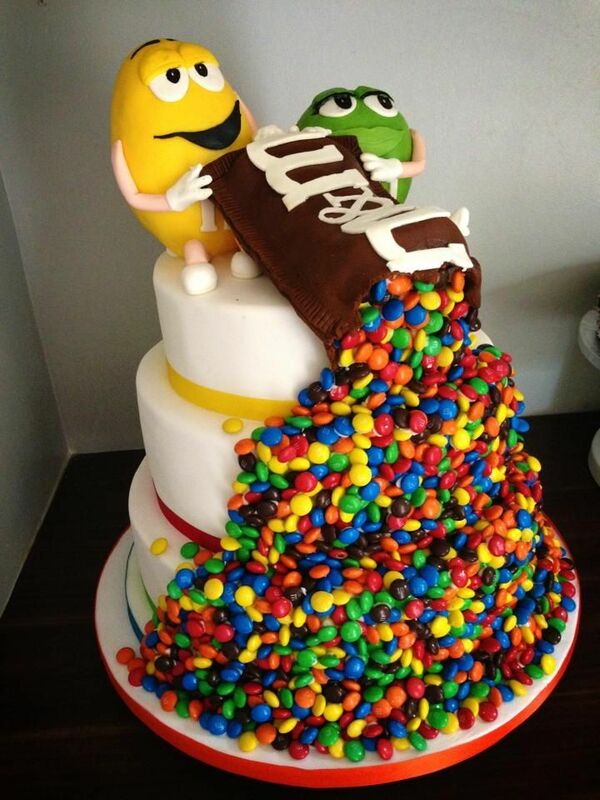 Like the M&M cake that I see everywhere now! Yummy!! I also want to make fancy wedding cakes and cute cupcakes and fun cake pops. ALL THINGS CAKE! Actually, I would love to just bake everything. All kinds of sweet and delicious things. I just have to teach myself some recipes and get on with it. I am setting a few goals for myself this month. And here they are! You can all hound me if you don’t see any updates. Go to the gym at least three times a week. Do not use work or anything else as an excuse not to go. I joined a gym that is open 24/7 so there is nothing stopping me from going, just myself. Bake at least one thing every week. It doesn’t have to be elaborate and fancy, just something new and exciting. Something that will help me practice. Write something every day. Something other than just a blog post. It doesn’t have to be part of one of the books I am working on, nor part of the short story. But it has to be something! Something creative too, I can’t use journal entries to count for this. Write something I am grateful for every day. Something new. Even on days where nothing seems good and I am in a bad mood. I had to come up with one more because I like odd numbers. So I racked my brain trying to figure out what other goal I could set for myself for this month. The only thing I could think of was taking my puppy to the dog park. I need to take her and let her socialize with other dogs. Who knows, maybe my soul mate has been waiting for me at the dog park. LOL I know…I have seen way too many romance movies and read too many love stories. So, one trip to the dog park a week? So there it is! I have a few fitness goals as well, but I will put those in another post. I will post one update a week on how all these things are going. If you want you can follow me on Twitter at HeartofHeather. I will keep daily post there. Let’s see if these goals will keep me going!